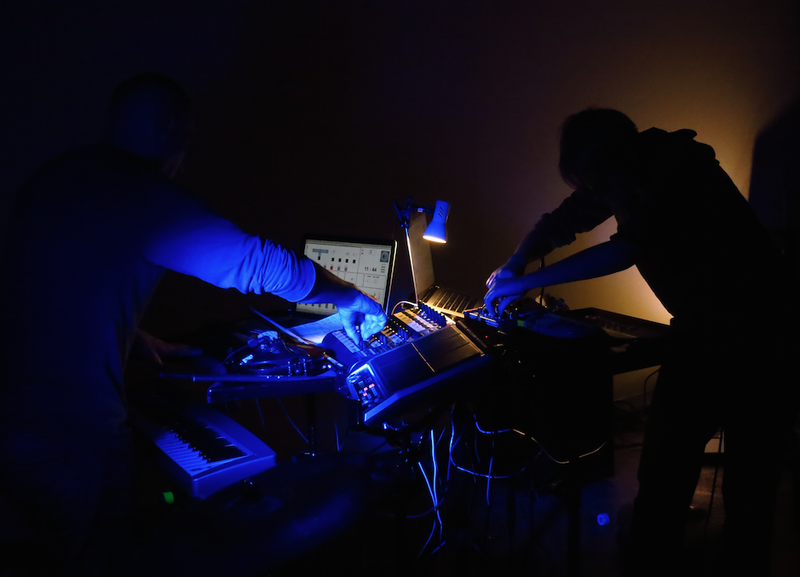 CLUBbleu work with analogue synthesizers, e-drums, field recordings and live-electronics. Being greatly inspired by influences from electro-acoustic music, Electronica, Industrial and Death Metal, CLUBbleu create their own musical cosmos based on urban soundscapes, sparkling synths, deep drones and broken blast beats. For this the most varied kinds of interfaces, controllers and sensors are integrated in their performance. 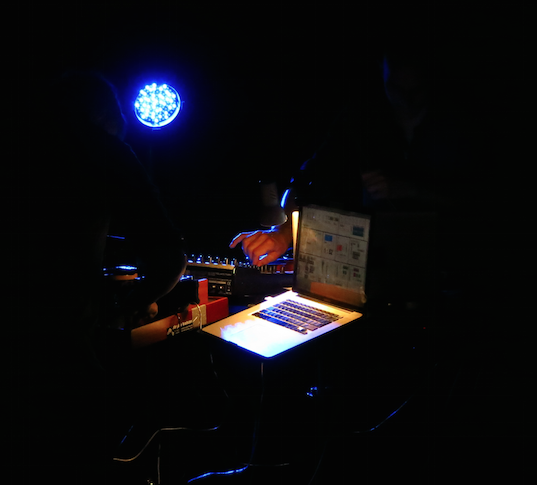 For their “DARK ENERGY – frankfurt album“ CLUBbleu developed a special method for recycling urban soundscapes into musical sound material. The sound spectrum of the city Frankfurt am Main as a symbiosis of engine noises and domesticated nature turns into a substantial element of compositional structure. For over one year CLUBbleu recorded various public spaces in Frankfurt focussing on so-called non-places. During their explorations concerning the musical quality of public spaces they observed a striking imbalance of auditory and visual impressions. Associated with this, CLUBbleu question whether urban spaces – originally designed as local recreation areas – over time change into acoustic non-places. CLUBbleu created a unique „sound of frankfurt“, based on polymorphic rhythm structures of sound waves reflecting between skyscrapers, sounds of circular saws and hammer blows spreading over the town, Europe’s largest building demolition to date and underwater recordings of the river Main. Especially the river works as a sort of natural band-pass-filter, that releases certain frequencies of the urban soundscapes, which are combined with sounds of ship’s propellers and flow generated noise. 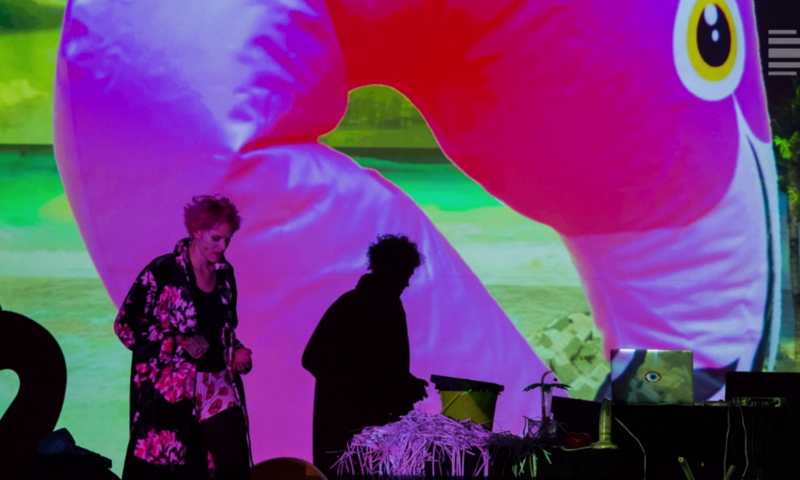 The recontextualization of non-place sounds is part of CLUBbleu ’s recycling process as well as the collection of sound material, its synthetic modulation and its integration into their compositional approach. 2014 CLUBbleu have been on a 3-months field recording trip to Singapore. With a bunch of extraordinary experiences, fancy new instruments and several megabytes of sounds they just started producing their upcoming CD [DARK ~asian~ Singacore].